"Mismatch theory" redirects here. For the theory of mismatching in affirmative action, see Mismatching. Evolutionary mismatch, also known as mismatch theory or evolutionary trap, is a concept in evolutionary biology that refers to evolved traits that were once advantageous but became maladaptive due to changes in the environment. This can take place in humans and animals and is often attributed to rapid environmental change. Timeline showing a period of mismatch following an environmental change. Mismatch theory represents the idea that traits that evolved in an organism in one environment can be disadvantageous in a different environment. This environmental change leading to evolutionary mismatch can be broken down into two major categories: temporal (change of the existing environment over time, e.g. a climate change) or spatial (placing organisms into a new environment, e.g. a population migrating). Since environmental change occurs naturally and constantly, there will certainly be examples of evolutionary mismatch over time. However, because large-scale natural environmental change – like a natural disaster – is often rare, it is less often observed. Another more prevalent kind of environmental change is anthropogenic (human-caused). In recent times, humans have had a large, rapid, and trackable impact on our environment, thus creating scenarios where it is easier to observe evolutionary mismatch. Because of the mechanism of evolution by natural selection, the environment ("nature") determines ("selects") which traits will persist in a population. Therefore, there will be a gradual weeding out of disadvantageous traits over several generations as the population becomes more adapted to its environment. Any significant change in a population's traits that cannot be attributed to other factors (such as genetic drift and mutation) will be responsive to a change in that population's environment; in other words, natural selection is inherently reactive. 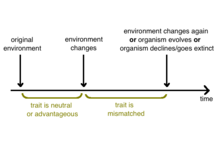 Shortly following an environmental change, traits that evolved in the previous environment, whether they were advantageous or neutral, are persistent for several generations in the new environment. Because evolution is gradual and environmental changes often occur very quickly on a geological scale, there is always a period of "catching-up" as the population evolves to become adapted to the environment. It is this temporary period of "disequilibrium" that is referred to as mismatch. Mismatched traits are ultimately addressed in one of several possible ways: the organism may evolve such that the maladaptive trait is no longer expressed, the organism may decline and/or become extinct as a result of the disadvantageous trait, or the environment may change such that the trait is no longer selected against. As evolutionary thought became more prevalent, scientists studied and attempted to explain the existence of disadvantageous traits, known as maladaptations, that are the basis of evolutionary mismatch. The theory of evolutionary mismatch began under the term evolutionary trap as early as the 1940s. In his 1942 book, evolutionary biologist Ernst Mayr described evolutionary traps as the phenomenon that occurs when a genetically uniform population suited for a single set of environmental conditions is susceptible to extinction from sudden environment changes. Since then, key scientists such as Warren J. Gross and Edward O. Wilson have studied and identified numerous examples of evolutionary traps. Many members of the scientific community continue to explore the effects of evolutionary mismatch in our quickly changing world. The Neolithic Revolution brought about significant evolutionary changes in humans; namely the transition from a hunter-gatherer lifestyle, in which humans foraged for food, to an agricultural lifestyle. This change occurred approximately 10,000–12,000 years ago. Humans began to domesticate both plants and animals, allowing for the maintenance of constant food resources. This transition quickly and dramatically changed the way that humans interact with the environment, with societies taking up practices of farming and animal husbandry. However, human bodies had evolved to be adapted to their previous foraging lifestyle. The slow pace of evolution in comparison with the very fast pace of human advancement allowed for the persistence of these adaptations in an environment where they are no longer necessary. In human societies that now function in a vastly different way from the hunter-gatherer lifestyle, these outdated adaptations now lead to the presence of maladaptive, or mismatched, traits. It should be noted that some modern human populations engage in hunter-gatherer practices. Human bodies are predisposed to maintain homeostasis, especially when storing energy as fat. This trait serves as the main basis for the "thrifty gene hypothesis", the idea that "feast-or-famine conditions during human evolutionary development naturally selected for people whose bodies were efficient in their use of food calories". Hunter-gatherers, who used to live under environmental stress, benefit from this trait; there was an uncertainty of when the next meal would be, and they would spend most of their time performing high levels of physical activity. Therefore, those that consumed many calories would store the extra energy as fat, which they could draw upon in times of hunger. . However, modern humans have evolved to a world of more sedentary lifestyles and convenience foods. People are sitting more throughout their days, whether it be in their cars during rush hour or in their cubicles during their full-time jobs. Less physical activity in general means fewer calories burned throughout the day. Human diets have changed considerably over the 10,000 years since the advent of agriculture, with more processed foods in their diets that lack nutritional value and lead them to consume more sodium, sugar, and fat. These high calorie, nutrient-deficient foods cause people to consume more calories than they burn. Fast food combined with decreased physical activity means that the "thrifty gene" that once benefit human predecessors now works against them, causing their bodies to store more fat and leading to higher levels of obesity in the population. Obesity is one consequence of mismatched genes. Known as "metabolic syndrome", this condition is also associated with other health concerns, including insulin resistance, where the body no longer responds to insulin secretion, so blood glucose levels are unable to be lowered, which can lead to type 2 diabetes. Another human disorder that can be explained by mismatch theory is the rise in osteoporosis in modern humans. In advanced societies, many people, especially women, are remarkably susceptible to osteoporosis during aging. Fossil evidence has suggested that this was not always the case, with bones from elderly hunter-gatherer women often showing no evidence of osteoporosis. Evolutionary biologists have posited that the increase in osteoporosis in modern Western populations is likely due to our considerably sedentary lifestyles. Women in hunter-gatherer societies were physically active both from a young age and well into their late-adult lives. This constant physical activity likely lead to peak bone mass being considerably higher in hunter-gatherer humans than in modern-day humans. While the pattern of bone mass degradation during aging is purportedly the same for both hunter-gatherers and modern humans, the higher peak bone mass associated with more physical activity may have led hunter-gatherers to be able to develop a propensity to avoid osteoporosis during aging. The hygiene hypothesis, a concept initially theorized by immunologists and epidemiologists, has been proved to have a strong connection with evolutionary mismatch through recent year studies. Hygiene hypothesis states that the profound increase in allergies, autoimmune diseases, and some other chronic inflammatory diseases is related to the reduced exposure of the immune system to antigens. Such reduced exposure is more common in industrialized countries and especially urban areas, where the inflammatory chronic diseases are also more frequently seen. Recent analysis and studies have tied the hygiene hypothesis and evolutionary mismatch together. Some researchers suggest that the overly sterilized urban environment changes or depletes the microbiota composition and diversity. Such environmental conditions favor the development of the inflammatory chronic diseases because human bodies have been selected to adapt to a pathogen-rich environment in the history of evolution. For example, studies have shown that change in our symbiont community can lead to the disorder of immune homeostasis, which can be used to explain why antibiotic use in early childhood can result in higher asthma risk. Because the change or depletion of the microbiome is often associated with hygiene hypothesis, the hypothesis is sometimes also called "biome depletion theory". Behavioral examples of evolutionary mismatch theory include the abuse of dopaminergic pathways and the reward system. An action or behavior that stimulates the release of dopamine, a neurotransmitter known for generating a sense of pleasure, will likely be repeated since the brain is programmed to continually seek such pleasure. In hunter-gatherer societies, this reward system was beneficial for survival and reproductive success. But now, when there are fewer challenges to survival and reproducing, certain activities in the present environment (gambling, drug use, eating) exploit this system, leading to addictive behaviors. Examples of evolutionary mismatch also occur in the modern workplace. Unlike our hunter-gatherer ancestors who lived in small egalitarian societies the modern work place is large, complex, and hierarchical. Humans spend significant amounts of time interacting with strangers in conditions that are very different from those of our ancestral past. Hunter-gatherers do not separate work from their private lives, they have no bosses to be accountable to, or no deadlines to adhere to. Our stress system reacts to immediate threats and opportunities. The modern workplace exploits evolved psychological mechanisms that are aimed at immediate survival or longer-term reproduction. These basic instincts misfire in the modern workplace, causing conflicts at work, burnout, job alienation and poor management practices. There are two aspects of gambling that make it an addictive activity: chance and risk. Chance gives gambling its novelty. Back when humans had to forage and hunt for food, novelty-seeking was advantageous for them, particularly for their diet. However, with the development of casinos, this trait of pursuing novelties has become disadvantageous. Risk assessment, the other behavioral trait applicable to gambling, was also beneficial to hunter-gatherers in the face of danger. However, the types of risks hunter-gatherers had to assess are significantly different and more life-threatening than the risks people now face. The attraction to gambling stems from the attraction to risk and reward related activity. Herbivores have created selective pressure for plants to possess specific molecules that deter plant consumption, such as nicotine, morphine, and cocaine. Plant-based drugs, however, have reinforcing and rewarding effects on the human neurological system, suggesting a "paradox of drug reward" in humans. Human behavioral evolutionary mismatch explains the contradiction between plant evolution and human drug use. In the last 10,000 years, humans found the dopaminergic system, or reward system, particularly useful in optimizing Darwinian fitness. While drug use has been a common characteristic of past human populations, drug use involving potent substances and diverse intake methods is a relatively contemporary feature of society. Human ancestors lived in an environment that lacked drug use of this nature, so the reward system was primarily used in maximizing survival and reproductive success. In contrast, present-day humans live in a world where the current nature of drugs render the reward system maladaptive. This class of drugs falsely triggers a fitness benefit in the reward system, leaving people susceptible to drug addiction. The modern-day dopaminergic system presents vulnerabilities to the difference in accessibility and social perception of drugs. In the era of foraging for food, hunter-gatherers rarely knew where their next meal would come from. As a result, filling their stomachs up with lots of food was advantageous since food was scarce. Intense consumption of high-energy foods was selected for when the availability of food was low and it was more difficult to find. Now, food is readily available, and the neurological system that once helped people recognize the survival advantages of essential eating has now become disadvantageous as it promotes overeating. This has become especially dangerous after the rise of processed foods, as the popularity of foods that have unnaturally high levels of sugar and fat has significantly increased. Evolutionary mismatch can occur any time an organism is exposed to an environment that does not resemble the typical environment the organism adapted in. Due to human influences, such as global warming and habitat destruction, the environment is changing very rapidly for many organisms, leading to numerous cases of evolutionary mismatch. Female sea turtles create nests to lay their eggs by digging a pit on the beach, typically between the high tide line and dune, using their rear flippers. Consequently, within the first seven days of hatching, hatchling sea turtles must make the journey from the nest back into the ocean. This trip occurs predominantly at night in order to avoid predators and overheating. Hatchling sea turtles must make their way back into the ocean. In order to orient themselves towards the ocean, the hatchlings depend on their eyes to turn towards the brightest direction. This is because the open horizon of the ocean, illuminated by celestial light, tends to be much brighter in a natural undeveloped beach than the dunes and vegetation. Studies propose two mechanisms of the eye for this phenomenon. Referred to as the "raster system", the theory is that sea turtles' eyes contain numerous light sensors which take in the overall brightness information of a general area and make a "measurement" of where the light is most intense. If the light sensors detect the most intense light on a hatchling's left side, the sea turtle would turn left. A similar proposal called the complex phototropotaxis system theorizes that the eyes contain light intensity comparators that take in detailed information of the intensity of light from all directions. Sea turtles are able to "know" that they are facing the brightest direction when the light intensity is balanced between both eyes. Dodo birds became completely extinct due to hunting. The Dodo bird lived on a remote Island, Mauritius, in the absence of predators. Here, the Dodo evolved to lose its instinct for fear and the ability to fly. This allowed them to be easily hunted by Dutch sailors who arrived on the island in the late 16th century. The Dutch sailors also brought foreign animals to the island such as monkeys and pigs that ate the Dodo bird's eggs, which was detrimental to the population growth of the slow breeding bird. Their fearlessness made them easy targets and their inability to fly gave them no opportunity to evade danger. Thus, they were easily driven to extinction within a century of their discovery. The Dodo's inability to fly was once beneficial for the bird because it conserved energy. The Dodo conserved more energy relative to birds with the ability to fly, due to the Dodo's smaller pectoral muscles. Smaller muscle sizes are linked to lower rates of maintenance metabolism, which in turn conserves energy for the Dodo. Lacking an instinct for fear was another mechanism through which the Dodo conserved energy because it never had to expend any energy for a stress response. Both mechanisms of conservation of energy was once advantageous because it enabled the Dodo to execute activities with minimal energy expenditure. However, these proved disadvantageous when their island was invaded, rendering them defenseless to the new dangers that humans brought. Before the English Industrial Revolution of the late 18th and early 19th centuries the most common phenotypic color of the peppered moth was white with black speckles. However, that changed when the Industrial Revolution produced high levels of pollution. Due to the Industrial Revolution the trees blackened in urban regions, causing the original phenotype to stand out significantly more to predators. Natural selection then began favoring the rare dark peppered carbonaria moth in order for the species to camouflage and prevent attacks. The dark moth's population expanded rapidly and by the 1950s vast amounts of England saw carbonaria frequencies rise above 90%. The once favorable white speckled phenotype quickly became mismatched in the new environment. However, in the late 1900s, the English made efforts to reduce air pollution, causing the trees to turn back to their normal shade. The change in color lead the dark skin phenotype to revert from beneficial to disadvantageous. Once again, the moth was not able to adapt fast enough to the changing environment and thus the carbonaria phenotype became mismatched. Since the trees' return to their natural color caused the original phenotype to become advantageous again since it allowed the peppered moth to hide from predators. Evolutionary mismatch can also be seen among insects. One such example is in the case of the Giant Jewel Beetle (Julodimorpha bakewelli). The male jewel beetle has evolved to be attracted to certain features of the female jewel beetle that allow the male jewel beetle to identify a female as it flies across the desert. These features include size, color, and texture. However, these physical traits are seen manifested in beer bottles as well. As a result, male jewel beetles often consider beer bottles more attractive than female jewel beetles due to the beer bottle's large size and attractive coloring. Beer bottles are often discarded by humans in the Australian desert that the jewel beetle thrives in, creating an environment where male jewel beetles prefer to mate with beer bottles instead of female jewel beetles. This is a situation that is extremely disadvantageous as it reduces the reproductive output of the jewel beetle as fewer beetles are mating. This condition can be considered an evolutionary mismatch, as a habit that evolved to aid in reproduction has become disadvantageous due to the littering of beer bottles, an anthropogenic cause. Normally, gaining information from watching other organisms allows the observer to make good decisions without spending effort. More specifically, birds often observe the behavior of other organisms to gain valuable information, such as the presence of predators, good breeding sites, and optimal feeding spots. Although this allows the observer to spend less effort gathering information, it can also lead to bad decisions if the information gained from observing is unreliable. In the case of the nutmeg mannikins, the observer can minimize the time spent looking for an optimal feeder and maximize its feeding time by watching where other nutmeg mannikins feed. However, this relies on the assumption that the observed mannikins also had reliable information that indicated the feeding spot was an ideal one. This behavior can become maladaptive when prioritizing information gained from watching others leads to information cascades, where birds follow the rest of the crowd even though prior experience may have suggested that the decision of the crowd is a poor one. For instance, if a nutmeg mannikin sees enough mannikins feeding at a feeder, nutmeg mannikins have been shown to choose that feeder even if their personal experience indicates that the feeder is a poor one. Evolutionary mismatch occurs in house finches when they are exposed to infectious individuals. Male house finches tend to feed in close proximity to other finches that are sick or diseased. This is due to the fact that sick individuals are less competitive than usual, in turn increasing the chances of the healthy male to win an aggressive interaction if it happens. To ensure that there is a lower possibility of losing a social confrontation, healthy finches are inclined to forage near individuals that are lethargic or listless due to disease. However, this disposition has created an evolutionary trap for the finches after the introduction of the MG disease in 1994. Since this disease is infectious, healthy finches will be in danger of contraction if they are in the vicinity of individuals that have previously developed the disease. The relatively short duration of the disease's introduction has caused an inability for the finches to adapt quickly enough to avoid nearing sick individuals, which ultimately results in the mismatch between their behavior and the changing environment. Worm charming is a practice used by people to attract earthworms out of the ground by driving in a wooden stake to vibrate the soil. This activity is commonly performed to collect fishing bait and as a competitive sport. Worms that sense the vibrations rise to the surface. Research shows that humans are actually taking advantage of a trait that worms adapted to avoid hungry burrowing moles which prey on the worms. This type of evolutionary trap, where an originally beneficial trait is exploited in order to catch prey, was coined the "rare enemy effect" by Richard Dawkins, an English evolutionary biologist. This trait of worms has been exploited not only by humans, but by other animals. Herring gulls and wood turtles have been observed to also stamp on the ground to drive the worms up to the surface and consume them. ^ a b c d Lloyd, Elisabeth; Wilson, David Sloan; Sober, Elliott (2011). "Evolutionary Mismatch And What To Do About It: A Basic Tutorial". Evolutionary Applications: 2–4. ^ Lean, Judith L.; Rind, David H. (2008). "How Natural and Anthropogenic Influences Alter Global and Regional Surface Temperatures: 1889 to 2006". Geophysical Research Letters (published 16 September 2008). 35 (18): L18701. Bibcode:2008GeoRL..3518701L. doi:10.1029/2008GL034864. ^ Connallon, Tim; Clark, Andrew G. (2015). "The Distribution Of Fitness Effects In An Uncertain World". Evolution. 69.6 (6): 1610–1618. doi:10.1111/evo.12673. PMC 4716676. PMID 25913128. ^ Mayr, Ernst (1942). Systematics and the Origin of Species, from the Viewpoint of a Zoologist. New York: Columbia University Press. p. 224. ISBN 978-0674862500. ^ Gross, Warren J. (1955). "Aspects of Osmotic Regulation in Crabs Showing the Terrestrial Habit". The American Naturalist. 89 (847): 205–222. doi:10.1086/281884. ^ Wilson, Edward O. (1959). "Adaptive Shift and Dispersal in a Tropical Ant Fauna". Evolution. 13 (1): 122–144. doi:10.2307/2405948. JSTOR 2405948. ^ Riggs, Jack E. (1993). "Stone-age genes and modern lifestyle: Evolutionary mismatch or differential survival bias". Journal of Clinical Epidemiology. 46 (11): 1289–1291. doi:10.1016/0895-4356(93)90093-g – via Elsevier Science Direct. ^ "Evolution Institute Projects: Evolutionary Mismatch". The Evolution Institute. ^ a b Cordain, Loren; Eaton, S. Boyd; Sebastian, Anthony; Mann, Neil; Lindeberg, Staffan; Watkins, Bruce A.; O'Keefe, James H.; Brand-Miller, Janette (2005-02-01). "Origins and evolution of the Western diet: health implications for the 21st century". The American Journal of Clinical Nutrition. 81 (2): 341–354. doi:10.1093/ajcn.81.2.341. ISSN 0002-9165. PMID 15699220. ^ Barker, Graeme (2006). The Agricultural Revolution in Prehistory: Why Did Foragers Become Farmers?. Oxford: Oxford University Press. p. 1. ^ Power, Michael L.; Schulkin, Jay (2013-01-02). The Evolution of Obesity. JHU Press. ISBN 9781421409603. ^ Knight, Christine (2011). ""Most people are simply not designed to eat pasta": evolutionary explanations for obesity in the low-carbohydrate diet movement". Public Understanding of Science. 20 (5): 706–719. doi:10.1177/0963662510391733. PMID 22164708. Retrieved 2016-11-13. ^ Alvergne, Alexandra; Jenkinson, Crispin; Faurie, Charlotte (2016). Evolutionary Thinking in Medicine - Springer. doi:10.1007/978-3-319-29716-3. ISBN 978-3-319-29714-9. ^ Lieberman, D.E. 2013. The Story of the Human Body: Evolution, Health, and Disease. Pantheon Books, New York, NY. ^ Garn, Holger; Renz, Harald (2007). "Epidemiological and immunological evidence for the hygiene hypothesis". Immunobiology. 212 (6): 441–452. doi:10.1016/j.imbio.2007.03.006. PMID 17544829. ^ Prokopakis, Emmanuel; Vardouniotis, Alexios; Kawauchi, Hideyuki; Scadding, Glenis; Georgalas, Christos; Hellings, Peter; Velegrakis, George; Kalogjera, Livije (2013). "The pathophysiology of the hygiene hypothesis". International Journal of Pediatric Otorhinolaryngology. 77 (7): 1065–1071. doi:10.1016/j.ijporl.2013.04.036. PMID 23701898. ^ a b Sironi, Manuela; Clerici, Mario (2010-06-01). "The hygiene hypothesis: an evolutionary perspective". Microbes and Infection. 12 (6): 421–427. doi:10.1016/j.micinf.2010.02.002. PMID 20178858. ^ Pani, L (2000). "Is there an evolutionary mismatch between the normal physiology of the human dopaminergic system and current environmental conditions in industrialized countries?" (PDF). Macmillan Publishers Lt. Retrieved November 13, 2016. ^ Spinella, Marcello (2003). "EVOLUTIONARY MISMATCH, NEURAL REWARD CIRCUITS, AND PATHOLOGICAL GAMBLING". International Journal of Neuroscience. 113 (4): 503–512. doi:10.1080/00207450390162254. ^ Sullivan, R. J; Hagen, E. H; Hammerstein, P. (7 June 2008). "Revealing the paradox of drug reward in human evolution". Proceedings of the Royal Society B: Biological Sciences. 275 (1640): 1231–1241. doi:10.1098/rspb.2007.1673. PMC 2367444. PMID 18353749. Retrieved 13 November 2016. ^ Nesse, R. M.; Berridge, Kent C. (3 October 1997). "Psychoactive Drug Use in Evolutionary Perspective". Science. 278 (5335): 63–66. doi:10.1126/science.278.5335.63. PMID 9311928. ^ Durrant, Russil; Adamson, Simon; Todd, Fraser; Sellman, Doug (10 Dec 2009). "Drug use and addiction: evolutionary perspective". Australian and New Zealand Journal of Psychiatry. 43 (11): 1049–1056. doi:10.1080/00048670903270449. Retrieved 13 Nov 2016. ^ Davis, Caroline; Carter, Jacqueline (2009-05-18). "Compulsive overeating as an addiction disorder. A review of theory and evidence". Appetite. 53 (1): 1–8. doi:10.1016/j.appet.2009.05.018. PMID 19500625. ^ a b Witherington, Blair; Martin, Erik; Trindell, Robbin (2014). "Understanding, assessing, and resolving light pollution problems on sea turtle nesting beaches" (PDF). Florida Fish and Wildlife Research Institute Technical Report TR-2 (2 ed.). 7: + 83. ^ a b Ecological Associates, Inc. (1998). Coastal Roadway Lighting Manual: A Handbook of Practical Guidelines for Managing Street Lighting to Minimize Impacts to Sea Turtles. Juno Beach, Florida: Prepared for Florida Power and Light Company. p. 5. ^ Witherington, Blair; Martin, Erik; Trindell, Robbin (2014). "Understanding, assessing, and resolving light pollution problems on sea turtle nesting beaches" (PDF). Florida Fish and Wildlife Research Institute Technical Report TR-2 (2 ed.). Florida Fish and Wildlife Conservation Commission. 7: + 83. ^ Oksanen, Markku (January 2007). "Species Extinction and Collective Responsibility". The Proceedings of the Twenty-First World Congress of Philosophy. 3: 179–183. Retrieved 16 November 2016. ^ McNab, Brian K. (1 January 1994). "Energy Conservation and the Evolution of Flightlessness in Birds". The American Naturalist. 144 (4): 628–642. doi:10.1086/285697. JSTOR 2462941. ^ Lloyd, Elisabeth; Wilson, David Sloan; Sober, Elliott (2011). "Evolutionary Mismatch And What To Do About It: A Basic Tutorial" (PDF). Evolutionary Applications. ^ Cofnas, Nathan (2016-01-01). "A teleofunctional account of evolutionary mismatch". Biology & Philosophy. 31 (4): 507–525. doi:10.1007/s10539-016-9527-1. ISSN 0169-3867. PMC 4901103. PMID 27358505. ^ "EBSCO Publishing Service Selection Page". web.b.ebscohost.com. Retrieved 2016-11-15. ^ Cook, L. M.; Dennis, R. L. H.; Mani, G. S. (1999-02-07). "Melanic morph frequency in the peppered moth in the Manchester area". Proceedings of the Royal Society of London B: Biological Sciences. 266 (1416): 293–297. doi:10.1098/rspb.1999.0636. ISSN 0962-8452. PMC 1689675. ^ "The Giant Jewel Beetle That Mates With Beer Bottles". About.com Education. Retrieved 2016-11-16. ^ Schlaepfer, Martin A.; Runge, Michael C.; Sherman, Paul W. (2002). "Ecological and evolutionary traps". Trends in Ecology & Evolution. 17 (10): 474–480. doi:10.1016/S0169-5347(02)02580-6. ^ Robertson, Bruce A; Chalfoun, Anna D (2016-12-01). "Evolutionary traps as keys to understanding behavioral maladapation". Current Opinion in Behavioral Sciences. Behavioral ecology. 12: 12–17. doi:10.1016/j.cobeha.2016.08.007. ^ Boulinier, Thierry; Danchin, Etienne (1997). "The use of conspecific reproductive success for breeding patch selection in terrestrial migratory species". Evolutionary Ecology. 11 (5): 505–517. doi:10.1007/s10682-997-1507-0. ISSN 0269-7653. ^ DALL, S; GIRALDEAU, L; OLSSON, O; MCNAMARA, J; STEPHENS, D (April 2005). "Information and its use by animals in evolutionary ecology". Trends in Ecology & Evolution. 20 (4): 187–193. doi:10.1016/j.tree.2005.01.010. PMID 16701367. ^ Parejo, Deseada; Danchin, Etienne; Avilés, Jesús M. (2005-01-01). "The heterospecific habitat copying hypothesis: can competitors indicate habitat quality?". Behavioral Ecology. 16 (1): 96–105. doi:10.1093/beheco/arh136. ISSN 1045-2249. ^ Seppänen, Janne-Tuomas; Forsman, Jukka T.; Mönkkönen, Mikko; Thomson, Robert L. (2007-07-01). "Social Information Use Is a Process Across Time, Space, and Ecology, Reaching Heterospecifics". Ecology. 88 (7): 1622–1633. doi:10.1890/06-1757.1. ISSN 1939-9170. ^ Kivelä, Sami M.; Seppänen, Janne-Tuomas; Ovaskainen, Otso; Doligez, Blandine; Gustafsson, Lars; Mönkkönen, Mikko; Forsman, Jukka T. (2014-12-01). "The past and the present in decision-making: the use of conspecific and heterospecific cues in nest site selection". Ecology. 95 (12): 3428–3439. doi:10.1890/13-2103.1. ISSN 1939-9170. ^ Zuberbühler, Klaus (2000-04-07). "Interspecies semantic communication in two forest primates". Proceedings of the Royal Society of London B: Biological Sciences. 267 (1444): 713–718. doi:10.1098/rspb.2000.1061. ISSN 0962-8452. PMC 1690588. PMID 10821618. ^ Rieucau, Guillaume; Giraldeau, Luc-Alain (2009-11-01). "Persuasive companions can be wrong: the use of misleading social information in nutmeg mannikins". Behavioral Ecology. 20 (6): 1217–1222. doi:10.1093/beheco/arp121. ISSN 1045-2249. ^ Mallon, E.; Pratt, S.; Franks, N. (2001). "Individual and collective decision-making during nest site selection by the ant Leptothorax albipennis". Behavioral Ecology and Sociobiology. 50 (4): 352–359. doi:10.1007/s002650100377. ISSN 0340-5443. ^ Seeley, Thomas D.; Visscher, P. Kirk (2004-07-22). "Quorum sensing during nest-site selection by honeybee swarms". Behavioral Ecology and Sociobiology. 56 (6): 594–601. doi:10.1007/s00265-004-0814-5. ISSN 0340-5443. ^ Ward, Ashley J. W.; Sumpter, David J. T.; Couzin, Iain D.; Hart, Paul J. B.; Krause, Jens (2008-05-13). "Quorum decision-making facilitates information transfer in fish shoals". Proceedings of the National Academy of Sciences. 105 (19): 6948–6953. Bibcode:2008PNAS..105.6948W. doi:10.1073/pnas.0710344105. ISSN 0027-8424. PMC 2383955. PMID 18474860. ^ Rieucau, G.; Giraldeau, L.-A. (2009-11-01). "Persuasive companions can be wrong: the use of misleading social information in nutmeg mannikins". Behavioral Ecology. 20 (6): 1217–1222. doi:10.1093/beheco/arp121. ISSN 1045-2249. ^ a b Bouwman, Karen M.; Hawley, Dana M. (2010-08-23). "Sickness behaviour acting as an evolutionary trap? Male house finches preferentially feed near diseased conspecifics". Biology Letters. 6 (4): 462–465. doi:10.1098/rsbl.2010.0020. ISSN 1744-9561. PMC 2936219. PMID 20164082. ^ Catania, Kenneth (2010-01-01). "Worm Charmers". Scientific American. 302 (3): 72–76. Bibcode:2010SciAm.302c..72C. doi:10.1038/scientificamerican0310-72. ^ Mirsky, Steve. "Where's My Fusion Reactor?". Scientific American. Retrieved 2016-11-16. This page was last edited on 20 March 2019, at 06:08 (UTC).